Hard to believe it’s been 10 years this Sunday since ‘The Crocodile Hunter’, Steve Irwin, was stabbed in the heart by an 8ft (2.5 meter) stingray while recording one of his wildly popular underwater documentaries. Known by millions around the world for his catchphrase “Crikey!” and apparent lack of fear, he died doing what he loved most, even if it meant tragedy for his family, friends and fans. The television personality and conservationist, who became world-famous for his daring stunts with dangerous animals, died in September 2006 while filming a documentary on the Great Barrier Reef in Queensland. Justin Lyons was the cameraman at the time and shot video of the death. The stingray’s “jagged barb went through his chest like a hot knife through butter,” Lyons said. G'day from @bindisueirwin on the #CrocTrip2016 🐊🌿 Here's a #Flashback to a croc trip years ago with Dad. In this photo Dad is checking all the ropes to ensure the safety of the croc and our awesome team. Toby, our team leader today, can be seen on the head of this gorgeous crocodile. We are so lucky to be following in Dad's footsteps still to this day, with his crocodile research work at the Steve Irwin Wildlife Reserve in Far North Queensland. Irwin was brought back on board the team’s research boat immediately, but the 44-year-old was dead before paramedics arrived on the scene. Lyons handed over footage of the incident to Irwin’s wife, Terri, and it has never been aired. “It's a huge loss to Australia - he was a wonderful character, he was a passionate environmentalist, he brought entertainment and excitement to millions of people,” Howard said. Irwin had similarly kind words to say about the conservative Howard in 2003, when he called him “the greatest leader Australia has ever had” and the “greatest leader in the entire world,” earning him scorn from many of his fans. Irwin’s death caused so much upset and shock among his fans, a number of apparent “revenge attacks” were carried out with 10 stingrays found mutilated in the weeks that followed Irwin’s death. Prior to his demise, Irwin took the reins at Australia Zoo, which was set up by his parents in 1970. Under Irwin’s control, the park grew from four acres to the 100-acre site it is today. Attracting tourists from around the world, the focus of the park is on conservation and animal rehabilitation, with a state-of-the-art veterinary hospital also located on the site. We’re honouring the legacy of a legend in the latest edition of Crikey! Magazine. 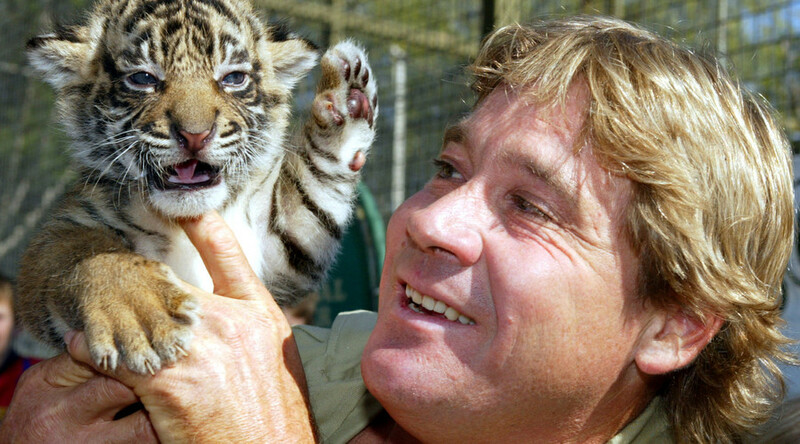 Steve was famous for wildlife conservation, inspiring millions of people around the world to love and protect wildlife and wild places. Head to our website to pick up your copy or subscribe to learn all about how we’re continuing Steve’s legacy and his important work. Visitors are able to mingle with and feed a number of the animals, including kangaroos and elephants, while also allowing the animals plenty of space. Relationships between Terri and Steve’s parents have not been as smooth since Steve’s death, however. Rumors began circulating in 2008 that Terri had banned Steve’s father, Bob, from the zoo after an argument with her, according to Adelaide Now. Shortly after the reports, Bob announced that he was resigning from Australia Zoo to continue “Steve's dream” at a new property. In a letter, he thanked all zoo staff, but didn’t mention Terri. Irwin’s two children have followed in their father’s footsteps, with daughter Bindi and son Robert seemingly equally passionate about wildlife. In late August, Bindi, 18, posted images on Instagram showing how she had caught a saltwater crocodile with her boyfriend during a visit to the Steve Irwin Wildlife Reserve in Queensland. “We are blessed to carry on in Dad's footsteps,” Bindi posted. The unopened letter was only found earlier this year by Bob Irwin while researching for his memoirs, ‘The Last Crocodile Hunter: A Father and Son Legacy’, due for release in October. “Probably one of the most unfortunate things in a ‘Bloke's Life’ is that it takes over 30 years to realize how essential you have been to build my character, my ethics and, most importantly, my HAPPINESS,” Irwin wrote in the letter.